Heat oven to 350. Spray 2 baking sheets with cooking spray or cover with parchment. 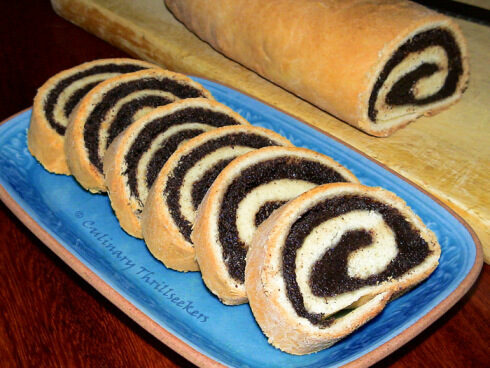 Make the filling by combining poppy seeds, sugar, ¾ cup of milk, butter and lemon zest. It should be thick but still spreadable. If too thick add a bit more of the boiled milk. Divide into 4 portions, one for each rollup. Make the dough by combining the yeast, lukewarm water and sugar in a bowl. Stir until yeast is dissolved. Blend flour and butter with wire pastry blender. Mix well, mix in eggs, salt add yeast. Mix until dough is smooth and leaves side of bowl clean. Do not let rise. Divide into four sections and roll each out in a rectangular shape and spread with filling. Roll up like a jelly roll. Place on baking pans and baked for 30 to 45 minutes or until brown.